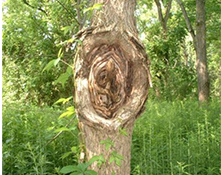 Nectria canker is one of the most common diseases of hardwoods in North America. It affects more than 60 species of trees and shrubs. In northern hardwood stands, the species most commonly affected are White and Yellow Birches, Red and Sugar Maples, Oaks and Aspen. Slightly sunken areas (cankers) develop around wound or damaged tissue. Smooth barked areas are generally darker brown that surrounding bark. Random branches and twigs do not leaf out in the spring. Branches of trees and the trunks of small trees are girdled and killed. The ridges look somewhat like a target, so Nectria cankers are sometimes called “target cankers.” The canker enlarges slowly, so the tree stem is rarely girdled and killed. 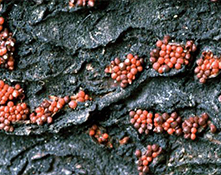 The fungus Nectria invades wood damaged by pruning, freezing, hail, animals and insects. This fungus is an opportunistic pathogen readily attacking damaged wood. It is active at all times of the year when temperatures are above freezing and sufficient moisture is present. Trees weakened by recent transplanting, root pruning by nearby excavation and especially by freezing are most susceptible to Nectria attack. If limbs are pruned during wet autumn weather, Nectria can readily invade the wound. 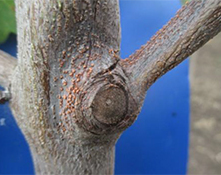 Vigorous trees usually form a callus, wall off the fungus with one year and recover. If a tree is not vigorous, invasion may continue and ultimately girdle and kill the branch or, in the case of small trees, the trunk, Fruiting bodies of the causal fungus generally appear in the fall at the margins of the cankers. They are bright red to reddish-orange, spherical, and .05 mm or less in diameter. Avoid pruning in the autumn especially if the weather is wet. Thoroughly prune diseased branches well below the affected areas during dry weather. Protect young trees from freeze damage, drought and other stresses. Chemical control for canker diseases is not always effective. For long-term management, improve host health and vitality using cultural means.